“What Masie Knew” by David Liss– I thought this was the best, most artfully-rendered story in the collection. Liss imagines a Fido-like alternate universe in which reanimated corpses have been repurposed as servants. There is, however, evidence that under certain circumstances, these servant-zombies can momentarily remember a little about their former lives. Connect this scenario with a protagonist who has some serious personal secrets, add twists worthy of De Maupassant, and throw in an illegal zombie gentleman’s club straight out of Zombie Strippers, and boom!, you’ve got an oustanding and unique short story. “What Masie Knew” has several haunting images that will stay with me for a long time. “Family Business” by Jonathan Mayberry— Mayberry’s story was the longest of the bunch. It was also one of the best. Written in many ways like a thriller, “Family Business” is a story for zombie fans who enjoy imagining the practicalities of being a real-life zombie killer. For readers who wish to marinate in the skins of those navigating the zombie apocalypse– day to day– I suspect this tale will be the favorite in this collection. “Twittering from the Circus of the Dead” by Joe Hill— Joe Hill is obviously a very talented writer, but his short stories are often too twee for my taste. For example, his story in The Library of America’s American Fantastic Tales Vol. II is called “Pop Art” and is about a character named Art who is inflatable. (It’s like: “And where’s this going… [bored sigh]). Yet, remarkably, while his story in The New Dead has all the first appearances of being his most-twee (tweest?) piece ever (it is written entirely in Twitter updates, and narrated by an adolescent girl), it completely won me over! When the rubber meets the road, Hill does not rely on cuteness, but rather awesome horror imagery (Tweeted as it may be) to propel the plot forward. “Twittering from the Circus of the Dead” also has a wonderful ending that really got me. Anyhow, those three were my favorites. 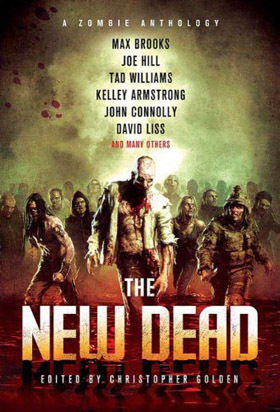 A few of the of the stories in The New Dead are a little bit bad (or boring), but are so in a “zombie way” which is still so much better than being bad or boring in other styles of fiction. (Just as bad zombie movies can rely on excessive gore– presented without verve or innovation– to compensate for a lousy narrative, so do a few of these bad zombie stories dwell on carnage in hopes of distracting the reader from a paper-thin plot.) However, the excellent stories in The New Dead more than redeem this book as a total package. I recommend it. What did you think of “Lazarus”? “Lazarus” reminded me of John Gardner’s “Grendel” and H.P. Lovecraft’s “The Outsider,” but was not one of my top-3 favorites. “Lazurus” seemed to present the titular character as a zombie come back to haunt, like Grendel haunting Heorot. I really enjoyed “Lazarus.” I thought it was a smart take on a story I’ve been familar with since I was a child, but never thought of in terms of the zombie genre. I’m not as familiar with the references you mention, but I guess I saw Lazarus less as a haunting character than one representing man being subjected to the whims of the gods. I also have more than a decade of Catholic schooling, so I’m certain that plays no small part in my impression of the story. Thanks for introducing me to “Zombie Strippers.” Oh, and the book review was appreciated, too. Enjoyable as it is, is the demise of the zombie genre drawing near?